Decorate Your Own Gingerbread House! Bring your family in for a night of sweet treats, good food, and holiday carols. At one of our three Family Fun Nights each December, you and your household are invited to decorate an our over-sized gingerbread house. You can have all the fun of decorating your gingerbread house without the hassle of cleaning it all up! For more than 16 years, we have opened our doors for families to create lasting Christmas memories. This year, is no different. 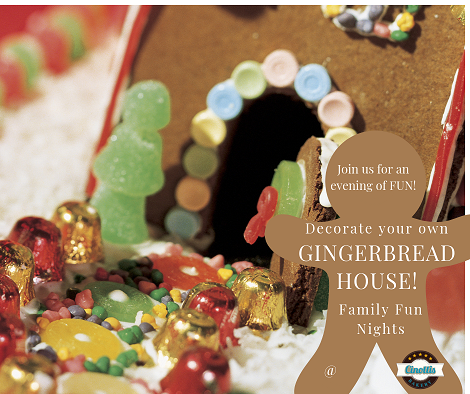 When you attend one of our Family Fun Nights, you and your family will leave with more than a gingerbread house. The family interaction and memories created during this time will be talked about for years to come. In fact, some of our returning families have participated in our Family Fun Nights since its inception in 2002. When you reserve your gingerbread house for Family Fun Nights, you have automatic access to unlimited icing and candy for your house. one of our friendly elves will be happy to assist. In addition to unlimited icing and candy for your house, we also provide ample hors d’oeuvre and beverages throughout the evening. If you don’t fill up on candy and icing, take a stroll to our desserts table for our selection of Christmas cookies! How Does Family Fun Night Work? When you’re ready, you and your family can start decorating! Once you’re finished, our friendly elves can add ‘snow’ to your house before packaging. What dates are Family Fun Nights offered this year? The first 3 Saturdays in December, we open our doors for Family Fun Nights. If you missed out on booking your Family Fun Nights for 2018, we do have Gingerbread House kits you can take home. Each kit comes with a pre-assembled house, generous amounts of candy and icing, a piping bag for those finer details, and a selection of Christmas rings and picks for finishing touches. With our take home kits, you can decorate your own gingerbread house in the comfort of your own home. How do I reserve my slot? UPDATE for 2018: ALL FAMILY FUN NIGHT reservations are booked for the 2018 year. For more information on how to decorate your own gingerbread house at home, please call one of our friendly elves. How long does FFN last? 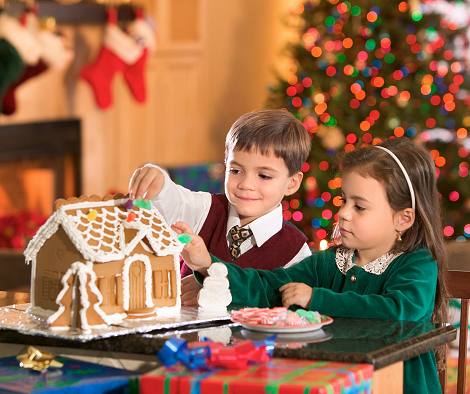 You and your family can enjoy decorating your gingerbread house from 4:00 pm to 5:30 pm each Saturday in December. How many people can decorate a house? While you will be decorating our large gingerbread house for Family Fun Nights, we cannot allow more than 4 guests to decorate one house. If you have a larger family, or would like to have a parents vs. kids competition, we certainly recommend reserving more than 1 house. Will you provide chairs this year? This will be the first year chairs will be permitted in Family Fun Nights. We are reducing the amount of families we will host each evening to allow room for chairs. In year’s past, we’ve provided our guests with Christmas cookies, coffee, and soft drinks. This year, we are expanding the menu to include an assortment of savory hors d’oeuvre as well as sweet treats. We will have freshly brewed coffee in our signature blend as well as our Winter Wonderland blend. We understand that plans can change during the Christmas season. 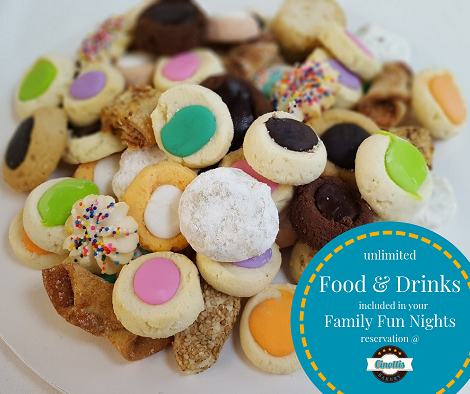 If you’ve booked a house for Family Fun Night and are unable to make your reservation, we will create a take home kit with everything you need to decorate your house in your own house at a time that fits into your schedule. Because this is a limited seating event, we do not offer refunds or store credits for Family Fun Nights reservations.